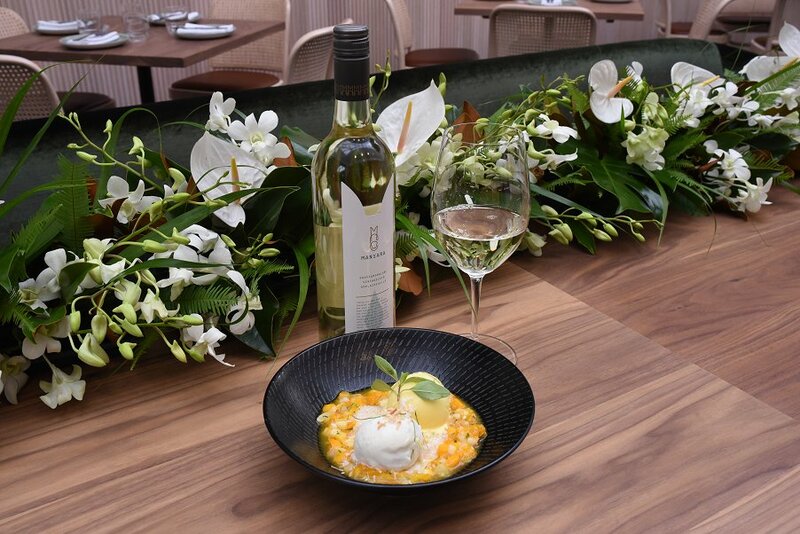 Situated five minutes from Adelaide’s CBD, the Feathers Hotel Precinct has long been a favourite for those who crave quality service in a gorgeous setting. However, following the establishment’s recent refurbishment, the Precinct is now pleased to introduce their innovative Greenhouse Restaurant, offering an innovatively chic and sophisticated dining experience. 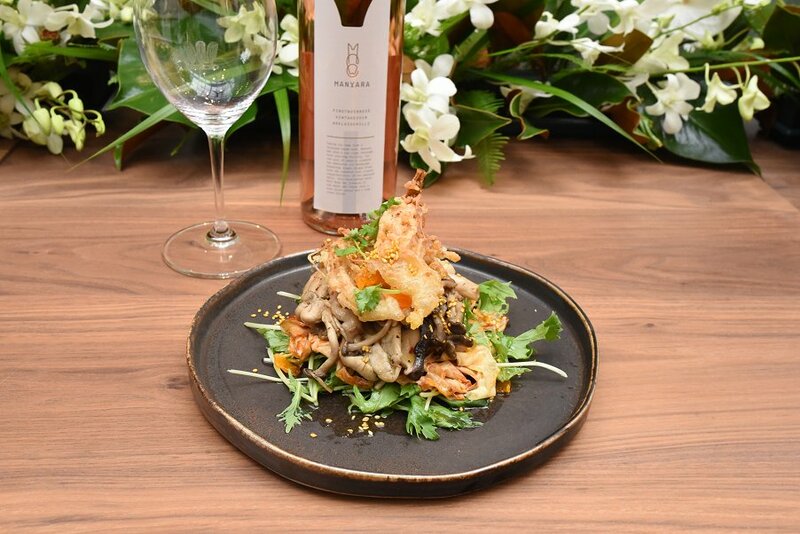 Ornamented with earthy tones and abundant greenery, this Atrium-style restaurant offers more than just awe-worthy décor; its fine wine cellar and refined Asian inspired menu, courtesy of Executive Chef Luke Brabin, are the true selling points. 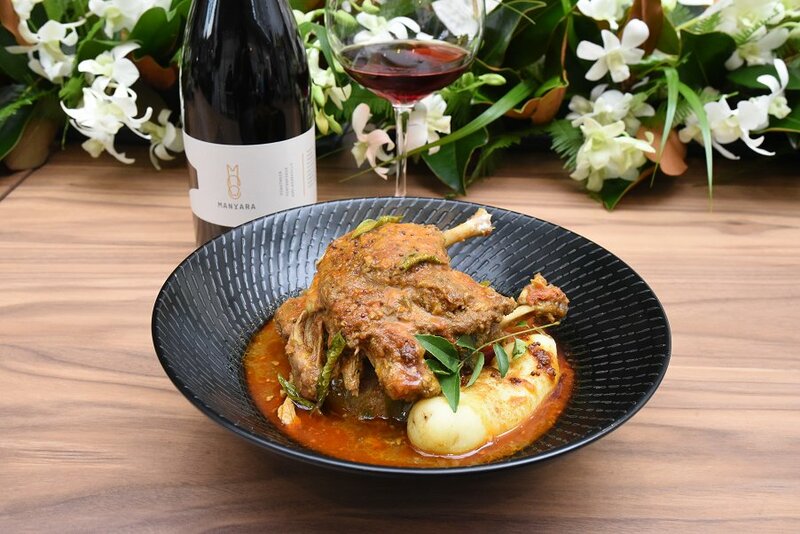 Focusing largely on recreating the flavours of Singapore, China and Malaysia, Brabin demonstrates his vast skillset through the use of high quality, local produce. 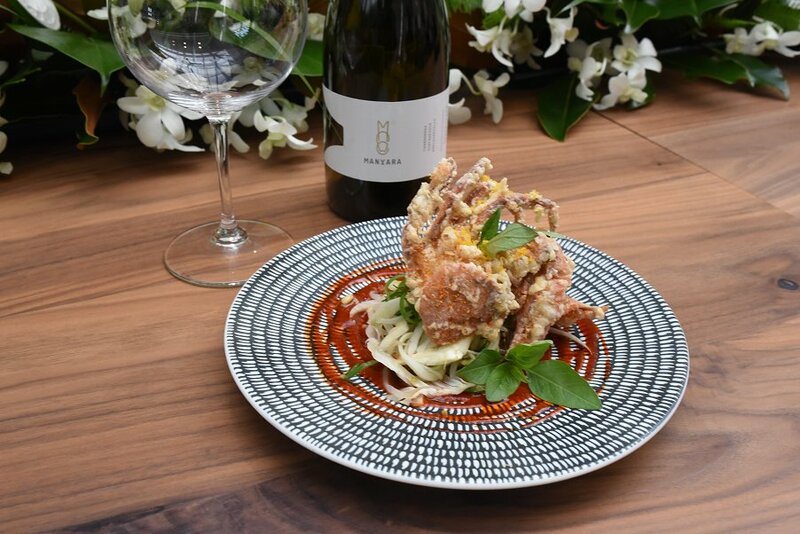 Lightly battered and cooked to perfection, the Singaporean soft-shell crab was an intriguing addition to the entrée menu. An array of Asian spices worked to complement the soft crab meat, making for a unique fusion of flavours. Paired with Asian greens and a mildly zingy red sauce, this dish was the ideal combination of light and delicious. 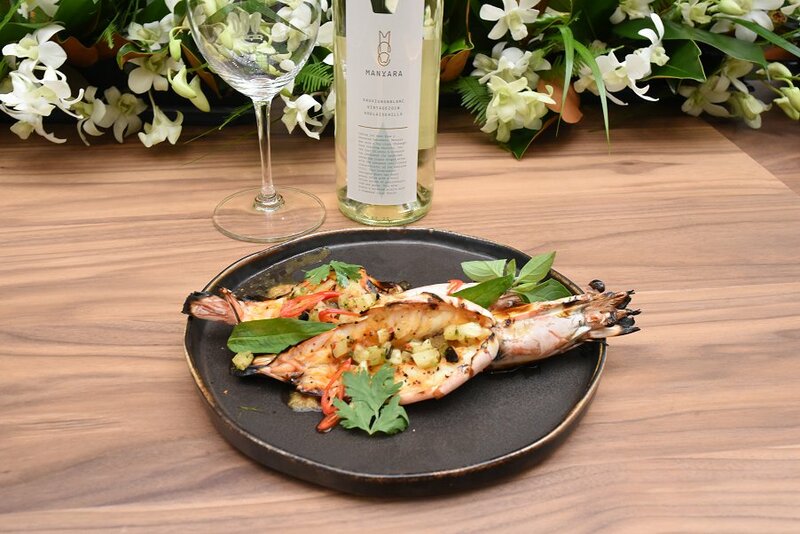 Locally sourced prawns from South Australia’s own Spencer Gulf, immersed in an expertly crafted concoction of spices, made for an utterly delicious dish. Garnished with coriander and accented with sweet and sour notes, this moreish marriage was an absolute winner. This complexly flavoured entrée brought together classic elements of Asian style cuisine with a western twist. the presence of the crispy mizuna provided a textural contrast to the softness of the mushroom and complementary salad greens. Presenting this combination of ingredients in a fresh, vibrant salad provided a dish that was equally as aesthetic as it was flavourful. 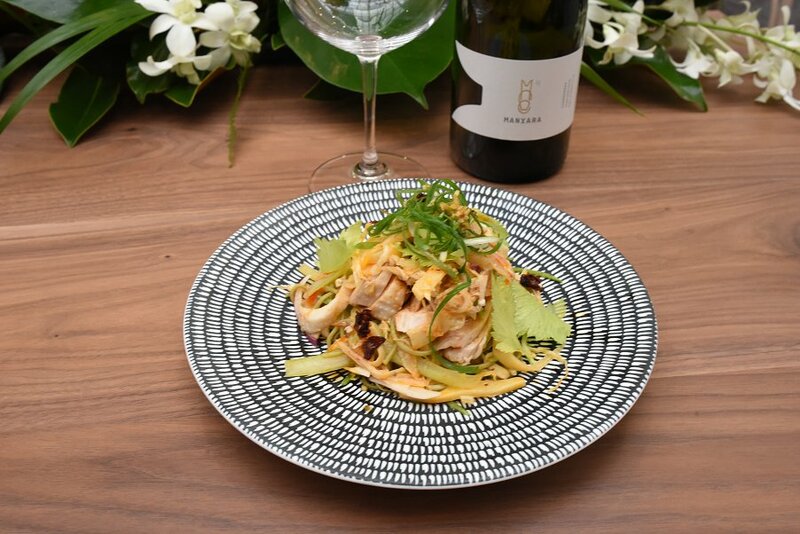 This refreshing chicken and noodle salad depicted the essence of authentic Asian cuisine. Tossed with banana blossom and seasoned with a subtle yet flavourful dressing, this salad was both delicious and subtle. 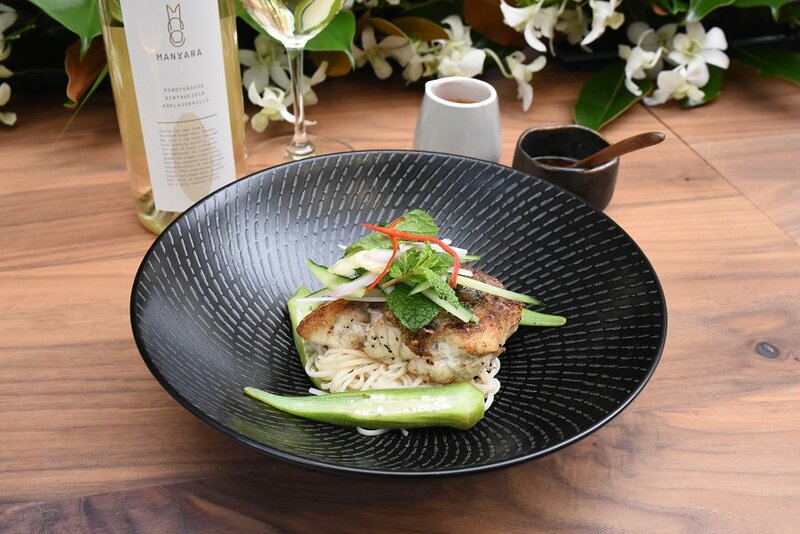 Deliciously tender Cone Bay barramundi, accompanied by soft, melt-in-your-mouth okra and served in a flavourful assam broth; this dish was yet another example of Brabin’s masterfully crafted creations. Infused by the sweet and sour notes of the broth, these elements made for a texturally delightful and tasty main. For all those vegetarians out there, this dish is an absolute winner. 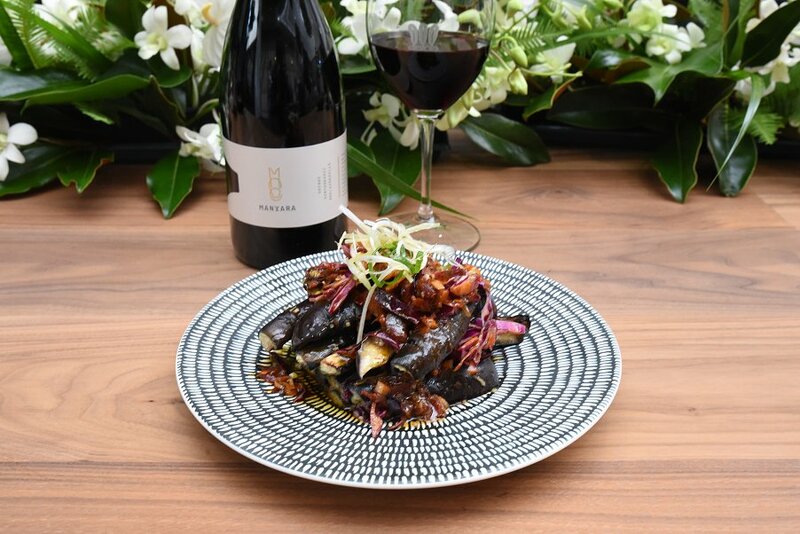 The emanating smokiness of the eggplant was infused throughout the dish, while the fermented chilli provided a welcome kick. The addition of Vietnamese mint provided an appropriate contrast to these intense flavours, making for a well-balanced palate. Heavily inspired by traditional Indian cuisine, this spiced duck masala was both delicious and cooked faultlessly. Tender to the point of falling off the bone, this generously spiced duck was a wonderful homage to its heritage. 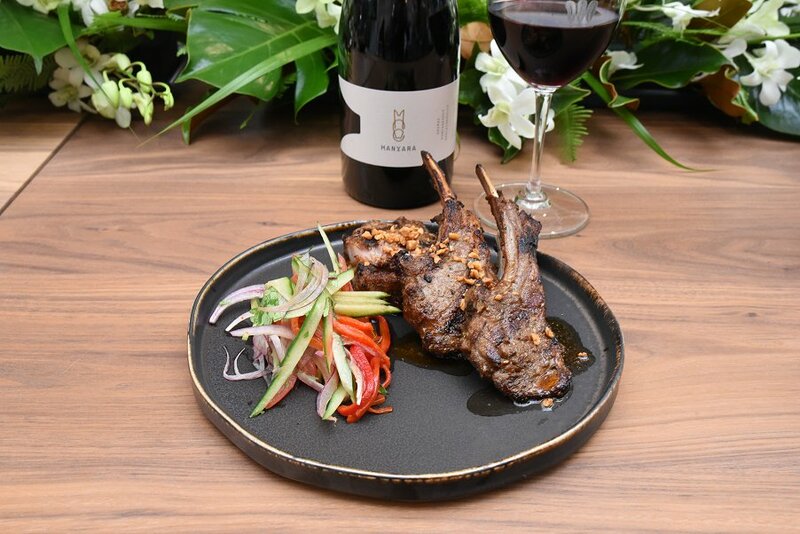 These beautiful lamb cutlets were enhanced by the warm, earthy flavours of their cumin seasoning; while simple, this combination was nothing short of delicious. Offset by the addition of a lightly dressed summer salad and an optional squeeze of lime, this harmonious union was simply divine. 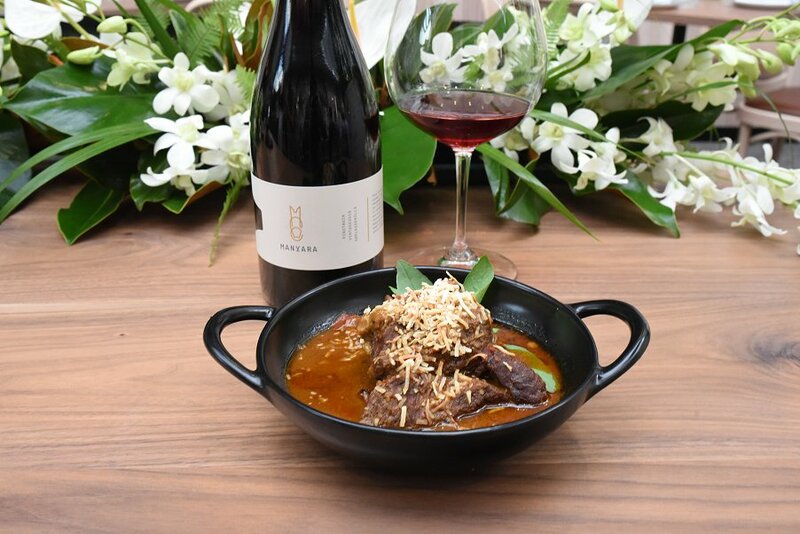 Served in a richly flavoured sauce and garnished with toasted coconut and mint leaves, this beef cheek was incredible. Tender and bursting with flavour, the accompanying oriental sauce was laden with spice, though did not overpower the dish. A definite favourite, this dish was an absolute winner! Somewhere between sweet and peppery, this dessert combined one the most commonly used ingredients in Asian cuisine. Combined, the syrupy nature of the palm sugar caramel and the bite of the ginger created a unique and delectable dish. Texturally, the stickiness of the sauce contrasted the gelatinous nature of the brûlée, making for a thoroughly enjoyable experience. Another Asian inspired dessert, this sago souffle accompanied by lychee salad and tropical gelati was a match made in heaven. The contrast between the intriguingly unique texture of the sago and the smooth tropical soup provided a dish that was just as texturally appeasing as it was delicious. Outstandingly presented and outlandishly tasty, the complexity of these dishes was a testament to the skillset of Executive Chef Luke Brabin. Collectively, the greenhouse’s beautifully adorned setup and wonderful, accommodating staff made for a stellar experience. If you liked the Feathers prior to their recent revamp, you’ll simply love the new Greenhouse Restaurant!